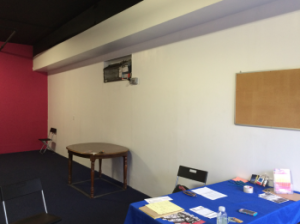 Beginning this month, we will open our space at Dancewave 182 to gallery exhibitions and installations. Join us February 21, 2016 as we host our first gallery exhibition! 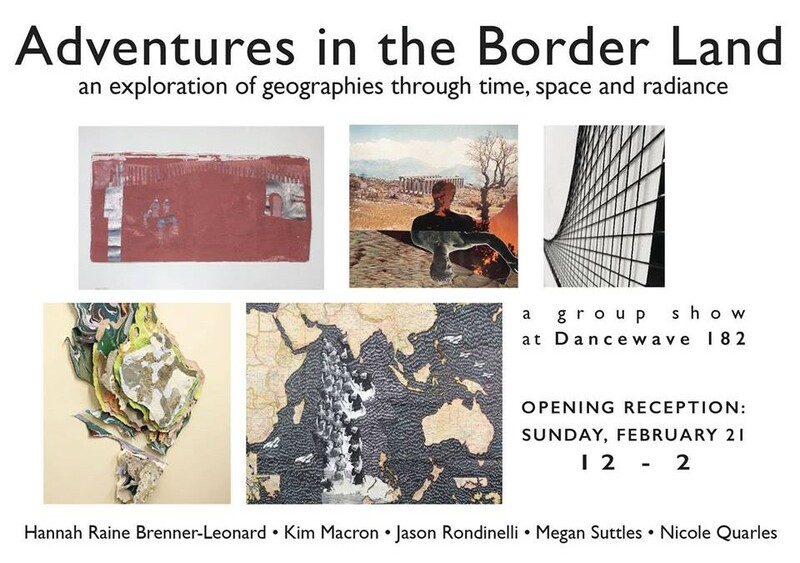 New York-based artists Hannah Raine Brenner-Leonard, Kim Macron, Jason Rondinelli, Megan Suttles, and Nicole Quarles present the opening of Adventures in the Border: an exploration of geographies through time, space and radiance, a group exhibition of mixed media. 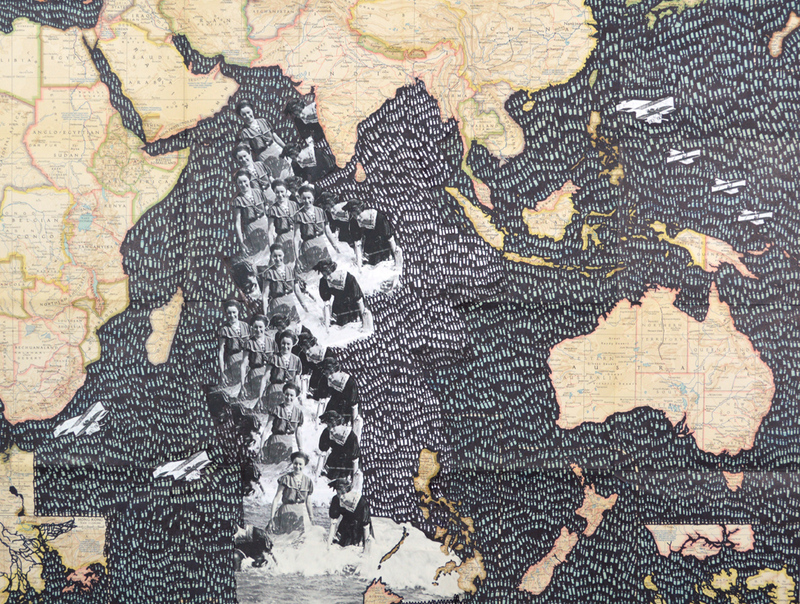 Each artist’s piece investigates and interprets geographical constructs through a variety of work, utilizing the space to present one cohesive exhibition. Hannah Raine Brenner-Leonard’s work combines drawing, repetition, and collaged images, examining perceptions of home, place, and memory. “House drawings”—a simple square and triangle—act as the foundation of her work and become complex through context, concept, and repetition. Kim Macron collages images with elements of movement, creating fluidity throughout the composition and exploring the relationship between landscape and bodies. Using handmade paper, Jason Rondinelli presents work directly inspired by the environment and glacial formations. Megan Suttles, implementing the space for her site-specific work, uses black string to collide chaos with structure, enforcing self-imposed boundaries as she creates the work. Nicole Quarles’ artwork examines terrain existing outside of the standard understanding of space and time. To celebrate this occasion, Dancewave Company II will perform a work exploring the ongoing human obsession with flying, in both dreams and reality. The piece investigates movement through the lens of flight, aerial motion, and winged creatures. 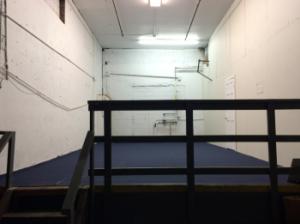 By welcoming visual artists and housing their work, we hope to build new bridges between the visual and performing arts spheres, reaching out to our Brooklyn arts community in a collaborative effort. 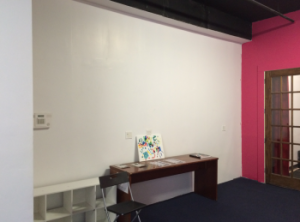 Dancewave 182 offers affordable gallery space for visual artists looking to expand audiences of their work. 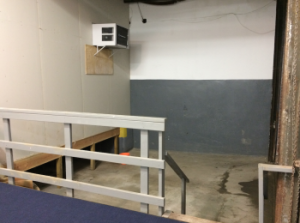 For more information, email rentals@dancewave.org or visit http://www.dancewave.org/StudioRental/gallery.